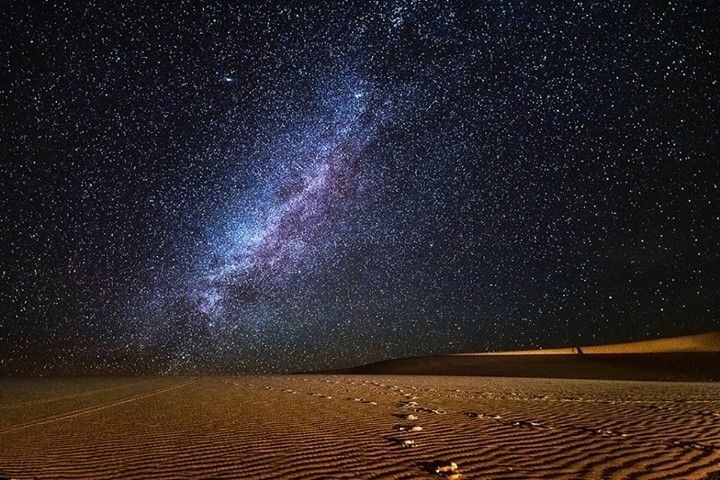 Michael Osborne finds his Bedouin camp under a zillion stars, with breeze whispering through mysterious Sahara sandhills, an amazing highlight of his journey across Morocco. It was the memory of this Arabian-style night that will stay with me forever. 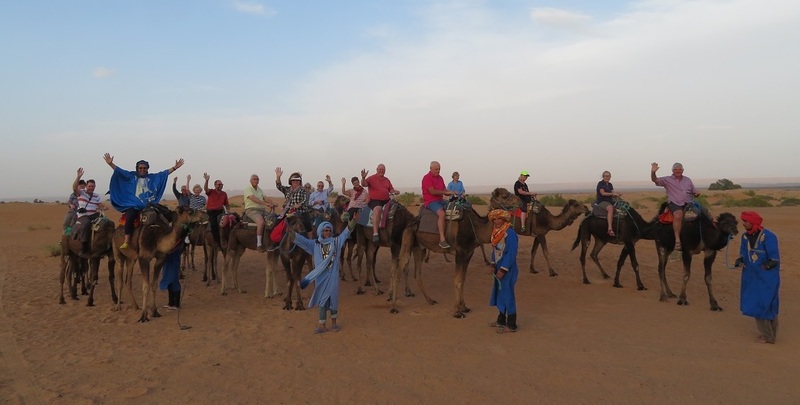 I was exploring Morocco with Back-Roads Touring, a company that goes far beyond normal travel operators in providing guests with the best of everything. The Bedouin Camp was a luxury “glamping” facility set up especially for us. This expedition into the previously unvisited Moroccan hinterland had been so interesting and exciting, yet was about to take on a whole new dimension. It was my first visit to the legendary Sahara Desert and staying in a Bedouin Camp was a dream come true. Our supremely comfortable coach arrived at Merzouga, a small Moroccan town near the Algerian border. It’s known as a gateway to Erg Chebbi, a huge expanse of sand dunes north of the town, where our band of excited travellers boarded 4WDs to head off into the Sahara proper. Our drivers, well familiarised in this region, soon had us on our way into the sandy unknown. As we sped across the desert, the drivers took turns in leading our convoy and putting the cars into adrenaline-inducing slides that had one fellow mature traveller cheering our driver to go faster. Clearly, she had been a bit of a wild one in her youth. 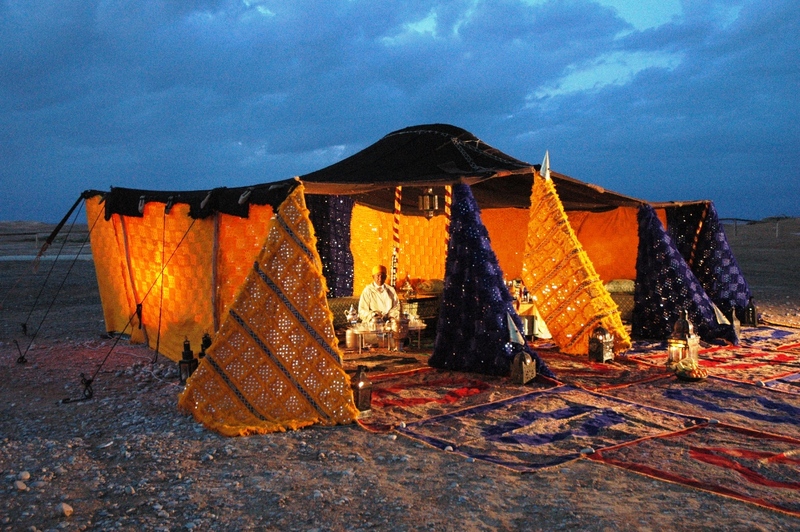 After skimming through the dunes, we came upon the campsite, a scene straight out of Arabian Nights. Huge tents were laid out with colourful carpets and a common area with large cushions to sit on, all around a fire-pit which proved welcome once the sun went down. After a welcome drink, our luggage was promptly carried to our respective tents, before a colourful camel train emerged out of the desert taking us on a sunset ride into the wilds of the Sahara. Another rewarding experience. Our individual tents were well equipped, fully carpeted and with a king-size bed, side tables with lamps, electric lights, a change room with hanging space and an ensuite shower and toilet. After settling into our tents it was time to sit around the fire, enjoy a few drinks and watch the sun set over the dunes as a zillion stars began to emerge and illuminate the night sky with a spectacular cosmic radiance. Could this get any better? Well, yes, it did. The band struck up traditional Berber music, entertaining us until the call to ‘The Feast’. The large main dining marquee was fully carpeted and stocked with a generous bar along with tables groaning under the weight of tempting delicacies, traditional finger food and enticing snacks. 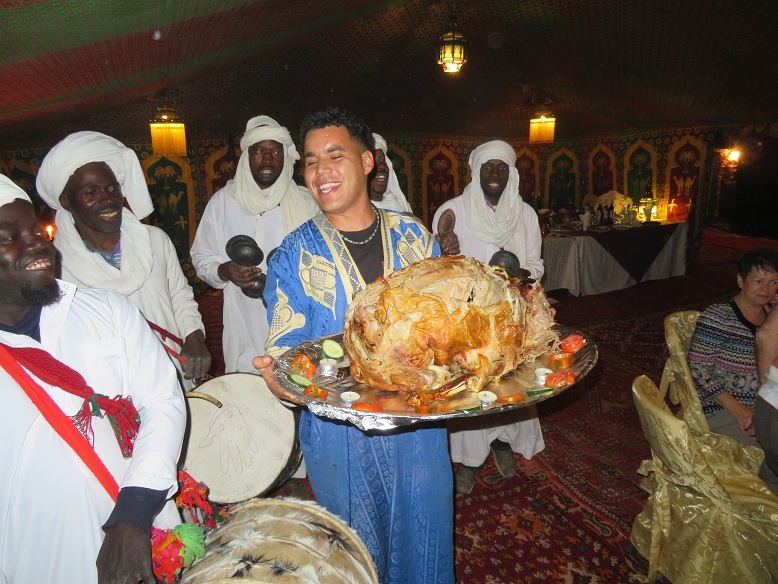 Once seated, and with yet more drinks served, our ground crew made a special presentation of serving the food, accompanied by more music and singing as our fire-roasted lamb arrived on silver trays with much pomp and ceremony. All our meals on the tour, each a gastronomic delight in itself, were specially cooked on the spot out in the out in the desert. After such an absorbing and satisfying day, we retire to sit around the fire and reflect on the wondrous things we had seen. Entranced by the hypnotic wonder of the night sky, many of us had to be reminded to go to our tents. Far away from the noise of the city, a deep restful sleep quickly overcame us. We awoke, fresh and rejuvenated, to another feast as breakfast had mysteriously conjured itself during the night. Again, quite a feat in the middle of nowhere. More praise to Back-Roads and their local team for their superb organisation. 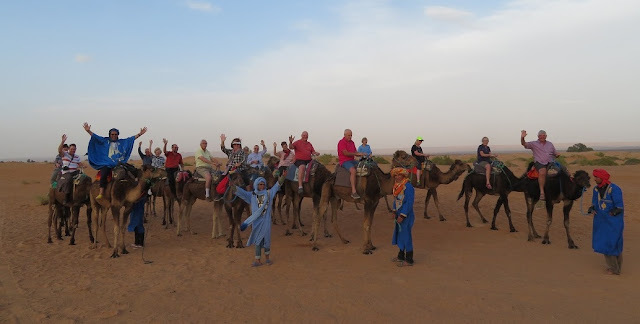 We raeturned to Merzouga in our fleet of 4WDs, where our coach was waiting to take us to the magic Todra and Dades Gorges before Quarzazate, our next destination. Michael Osborne travelled as a guest of Back-Roads Touring.